Thank you all for your continuous support in contributing to Attepeu Flood Relief Efforts. Since the onset of this tragic event that has occurred on July 22, 2018, Jai Lao has raised and received $106,000. There is an additional expected amount of $122,000 to be received from Facebook Network For Good at month end of September 2018. Our donations to date would not have been realized without your contributions and your individual fundraising events throughout the United States and Canada. We are truly humbled and extremely grateful to everyone who has shared in our vision and believed in our mission of Jai Lao. Half of Jai Laos Relief Effort Team from USA (California and Boston) arrived safely in Vientiane and the other three from (Atlanta, Chicago and California) will arrive on three separate days. We had a meeting with a team of volunteers at midnight to update our plan of action. We have a local business owner who have donated a semi truck with driver to haul all the supplies the 10 plus hours to Pakse Saturday morning. The semi is also carrying 30 coffins to the flood site. In Pakse we will buy more supplies there and should be in the evacuation are to distribute by Sunday or Monday. But before we do that we want to work out your logistics with officials and get a head count on how many families, etc. Today we shopped for supplies for the relief effort. From what we are told, there are plenty of food, water and clothes from people throughout Laos and Thailand. Some things that are being requested are: undergarments, feminine hygiene, dental, toiletry, blankets, pillows, and Jai Lao also got tents for their temporary shelter. With partnership from Panyathip School in Vientiane, Jai Lao made 600 bags of essentials listed above for men, women and children. Panyathip School parents and Nong Buddy’s team members also donated clothes and helped packed the supplies. The team members from the USA flew to Pakse that evening and the rest are driving with the big truck early Saturday morning. From our understanding, it is still considered SEARCH & RESCUE zone and time right now where rescue teams from Laos, Thailand and China are working together to bring people to dry land. All donations are to be dropped off at one of the four evacuation site set up, the biggest one in Paksong, a warehouse where hundreds of people found refugee. All the families have been sent back to their villages from this site. 11 villages were affected by the flood, of which 6 got hit the hardest. The other three sites are in Attapeu Province and this morning we are driving the 3 hours there to initially access the situation ourselves before we can move forward. The provincial administration office is the donation drop off center where generous people and businesses from all over Laos and Thailand came to drop off truck fulls of donations. The warehouses were all filled past capacity and they used hotels and gas stations for extra storage. The villagers who still had a tok tok vehicle left drove their families in it to go get donations at the refugee camp. We tried to go further to the villages that was more affected by the flood even greater. However we couldn’t cause the road’s higher mud level made it impassible. A couple of celebrities from Thailand visited the refugee center to donate which inspired a trove of Thai citizens to come visit and donate. We are scheduled to go to the Province office to declare our donations tomorrow and ask for approval to personally hand deliver the donations ourselves. We will see if we are taking boats or off road vehicles to go distribute bagged supplies. Thanks to our partners Panyathip School and Moo Panh who both have been vital in helping Jai Lao with our relief efforts. After much observation of the situation at hand it’s clear to us that the aftermath aid for the flood victims is paramount. The convoys of donations and volunteers will soon start to recede like the water and it’s then that the villages will need the most help. Jai Lao is brainstorming various ways how we can help the families rebuild their lives when everyone else leaves. We may not be able to provide as much relief this moment as we’d hope to but we are glad we got to be here to see and experience everything first hand so we can come up with a solid solution to help the villages recover in the months to follow. Sanamxai, Attapeu is a town about 10 miles from one of the villages that got hit by the flood. It’s only accessible by a four wheel drive. It is set us as a base camp for the relief effort. Five refugee sites, rescue centers, cooking area, etc. have been set up with hundreds of volunteers working round the clock. Close to 5,000 people still live in these camps and some have returned back home (if there is a home still standing) when the water receded. They are taken care of quite good and are eating three warm meals a day, more than what we would get in our villages many villagers expressed. For those that aren’t at camp, a team of volunteers drive in off road vehicles to deliver the meals as well as other essentials they need. The main donation center in Attapeu city sends supplies by boat or truck to Sansamxai relief effort sites. It was a long and difficult day for Jai Lao to as we worked feverishly to ensure that we get to deliver the donations to the families that have returned to their villages. After a very long duck and goose chase we were not able to go to the villages due to not having the right access of vehicles. But we are still delighted they we can personally had deliver our bags of essential things ourselves. We have out four truck loads of donations to seven villages that were living at the refugee center. We had them gather one family member each where the chiefs had a list and numbers of families in his village. Every family member received things (rent, blanket, toiletries, dental kits, hygiene kits, flip flops, clothes, and shoes) that they would need to be comfortable at the camp in the next few weeks at least. The villagers were so happy and grateful and they shared how they really like the way we did the distribution as it was very fair and good. Today we return back to try to get into the villages with the help of the Thai rescue team who’ll drive us in with their off road trucks. Jai Lao is so glad and grateful we are here in the initial stage of relief efforts for Attapeu. We can see and hear things with our own eyes and access the situation more accurately and come up with a sustainable solutions to help the families. All of this is made possible because of your compassionately caring and generous heart!! We are so delighted to partner with Panyathip International School and Moo Panh Team to make this relief effort come together so nicely. Home is where the heart is but what if there is no home? Where does the heart go to then? This is one of eleven villages that was affected by the collapsed dam in Sanamxai district Attapeu Province, Laos. Four villages got hit the hardest and this one pictured was not even hit from direct impact. Imagine the toll on the others that had the flood come crashing down on them. One village only has three homes still left standing. This morning started at 5 am. We went to our big truck to unload the supplies into three more trucks to drive the 2 hours to get to Sanamxai district where a three refugee camps have been set up. We arrive at the Thai Rescue Foundation Center who’s got the off-road vehicles to take us to Ban Boak, another refugee camp that’s ome and a half hours drive away but only 10 miles. We helped them pack 600 boxes of food before we head out. We arrive here with three trucks of donations and saw that the Chinese have set up a medical aid center to treat the families. A few villages have gathered at this camp site which is the furthest camp site. Some families of various villages are at different camps depending on where they may have been rescued and some have returned to their homes once the water level have gone down. The village chiefs wanted us to “go ahead and leave the donations here and we will make sure that everyone gets it”. Right! Even though it’s so much harder to distribute the donations ourselves we do it to ensure everyone gets the donations equally. It is wet and raining and yet the people are outside waiting for their lunch from the Thai rescue team and are happy to get a visit from us. It’s not a sight for the faint of heart to see the kind of living conditions they are in. Their basic needs especially food and water are being more than met. A few elders shared, “we can’t complain about being here cause we get to eat better than if we are at our village homes. We just miss our home but also like the fun and friendship at camp too”. They stand in need of basic human necessities which is what Jai Lao provides. This is only the beginning of long term rebuilding effort that Jai Lao will focus on. Thank you ever so kindly for the thousands of you who’ve donated to help with the relief effort in Attapeu, Laos. Flood relief effort update before heading out to villages and camp site. While Soutkita Laod is in Attapeu to help the families affected by the flood, Jai Lao board members from Canada, Atlanta, Nashville, and San Francisco are diligently working round the clock with questions and answers for supporters and donors from all over the world. We loaded two more trucks and drove the four hours to Xai Don Khone village which was affected by the dam collapse. The damage were in rice fields, water buffaloes, cows, and livestock. This village is further than the other ones we visited so not too many visit to provide aid. We were scheduled to also visit the refugee camp that’s further down the road but we were behind schedule by over two hours due to someone’s truck being stuck in the mud. The helpful military men helped transfer our donations into their truck and drove our things to the village where 181 Taliang ethnic families excitedly awaited our arrival. We had to leave the village before nightfall so we decided to do the camp tomorrow. We assured the villagers that this was the beginning of more aid to come from Jai Lao and the Lao brothers and sisters overseas. They’re extremely grateful for whatever help we can give them especially because they’ve been overlooked due to their location. When Jai Lao visits again to provide a more in depth aid we will help all 13 villages that the flood affected and it’ll be based on the needs of each of the villages. More flood victim survivors rescued and brought over to Tam Ma Yok village which is the fifth refugee camp in Sanamxai district. The families here are from Hin Lad, a village that got hit first and the hardest from the dam flood. All 138 homes including the temple have all been washed away. Will share photos of that village with you later. Two more bodies were uncovered from deep in the mud today by the Attapeu army team. Seeing these refugees reminded us of our own refugee days. People are living in tight spaces cause they’ve used the school as a place of refuge until the Lao PDR can figure at how to house the displaced families who’ve lost everything. We were there when the President and General of the Lao Army paid a visit to Ban Hin Lad. Right now it’s still search and rescue time as lost family members are being searched for. The press is allowed to come in as long as they officially check in with the government and get a badge. The military was very helpful in our inquiries about the flood and lives lost. The best way to find out the story is to be at the source and talk to the villagers directly and we talked to many from this village. The stories we’ve heard really shows how strong and resilient human beings are in the face of a horrific catastrophe. Our day started at 5 am this morning. Jai Lao team members loaded two more trucks with donations from USA supporters and local Lao people from our partner Moo Panh team then we drove almost five hours to finally get to our destination thanks the last half of our long drive to the Lao Army, Champasak unit. THANK YOU! We wouldn’t have made it there without their help because of the really muddy road conditions. These hard working and very kind soldiers was so amazing at helping us on our mission to deliver donations to the villagers personally. They even helped others who got stuck in the mud many times. Our teamwork was a beautiful thing to see materialize as we got to know them beyond their uniforms. We saw that they’re regular nice guys and their job is very difficult with very little pay. From what we observed after spending the day with them is that they truly care about the villagers and what happened to them. They’d ask them for their stories and always offer positive words of comfort. We were very touched to see the compassion these guys have and how excited they were to be a part of our team to give to the families personally. 167 families live in a refugee camp in Tam Ma Yok. Families who’ve found refugee here are from Hinh Lad which was the village that got hit first and the hardest from the collapsed dam flood. All the homes, including the temple, was wiped out completely. Villagers were fortunate to escape death with just the clothes on their backs and some even lost that. This campsite is the farthest out and so not receive as much aid as the others. There is no common kitchen where volunteers are there to provide food and other aid. A few families live in one school room and some in any space with a roof. It’s very heartbreaking to see their conditions and how different it is in terms of having lacking a more organized relief effort for them. Each family is left to fend for themselves but that can be challenging when there are no cooking ware to prepare meals. All of our donations have been delivered in four days time but we feel we need to get kitchen ware brought to the families today. More supplies are needed to donate to Hinh Lad village where 168 families literally lost all their homes along with every possession they owned inside. So many people are giving them clothes and noodles but they’re still lacking the most basic of human needs. It would really help to not have such feelings of hopelessness and helplessness if they can have the ability to take care of themselves which is vital to their mental and emotional wellbeing. We are making gift bags with the following items in for every families who’s lost their homes. Cooking essential: pots, dishes, knives, silverware, chopsticks, platter, koke sak, kiang, huad Thip khao, ladle, tub (saum) with washing clothes things, bathing basket with toiletry set like soap, shampoo, dental kits, comb, nail clipper. After five days of distributing donations from Jai Lao and our local Lao partners, Moo Panh and we had to buy more supplies to donate to the Hin Lad. We went there to donate clothes and other hygiene essentials and after taking with many villagers we decided we had to come back to give them the things they asked for that will help improve their quality of life at camp. 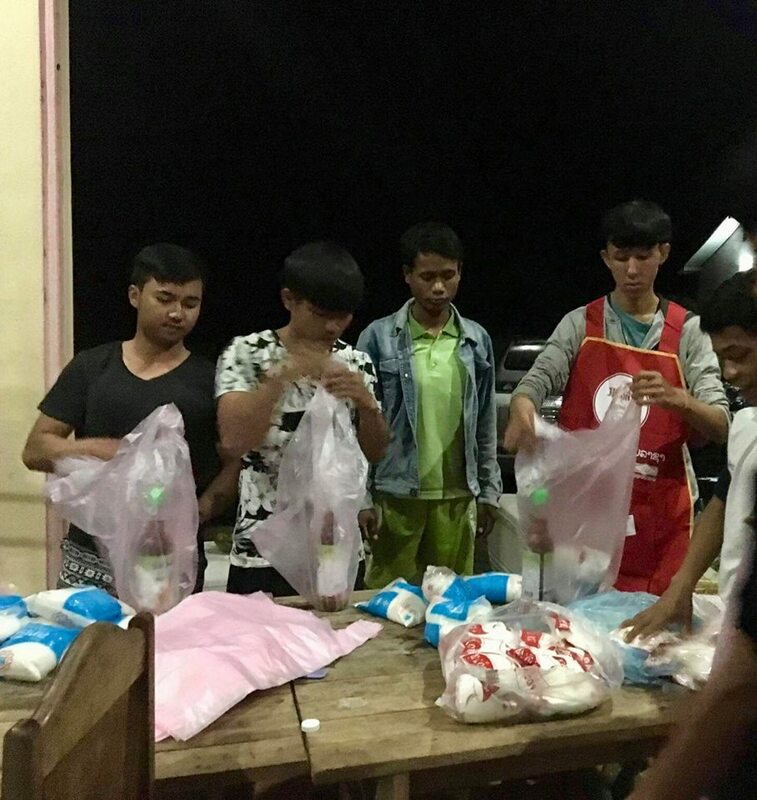 With the help of the Champasak Province army unit Jai Lao handed out kitchen and cooking essentials, household goods, dental, toiletry, and dental, etc. that are needed to feel self sufficient. The villagers were so happy to receive these wonderful and much needed gifts from USA and Canada and all over the world. Several ladies came up to Soutkita Laod to personally say thank you and gave her kisses on her cheeks. It truly warms our hearts to see the villagers smile and have some hope in the days ahead. They’re so beautiful and resilient and grateful that they have their lives. A complete village of homes is wiped out and a beautiful adorned temple stands still and tall as a beacon of hope. It’s filled with sand and debris but it’s also filled with a renewed sense of gratitude and dreams for a brighter tomorrow. The magnitude of damage to Hin Lat from the collapsed dam flood is far greater than meets the eyes and what these photos capture. What you don’t see is the smell that permeates in the air. It’s the smell of death, fear, sadness, helplessness. What’s left to rebuild of one’s life when even the foundation is washed out? The foundation of something is supposed to be the anchor and strength that keeps everything together. The people of Laos are resilient and strong people. They’ve gone through some of the worst natural and man afflicted tragedies and every time they’ve prevailed. An amazing side of humanity emerges during the deepest and darkest of hours. Our helping hands reach forth to pull one another out from the wreckage and together we shall build a stronger foundation and home of even stronger love and hope. Thank you to everyone from throughout the world who’ve supported the families affected by this catastrophe. Your every thoughts, prayers, support, and donations is felt in the hearts of the villagers in Laos. Hoping those who can never thank or repay us is one of life’s truest form of blessings. A small gesture of sweet kindness goes a long way. Visiting villages to distribute donations directly and personally to the village families is not a common thing people in Laos do. Most drop off their donated goods or money to the provincial administration and let the state take care of it. Jai Lao has always felt it the most fair and rewarding to give it to them in person. We enjoy seeing their faces and knowing exactly that those that need help are receiving it. Our “art of giving” this way started as far back as 2008 and we will continue to give this way even if it means a lot of work for us. At the end of it all, it isn’t about us and how we feel. It’s only about the children and how they feel and see the world. We hope our presence is warm and loving and gives them a sense of hope knowing how much we do care for their well being. We like to break the ice with the children by offering sweet treats before we start handing out the donations one family at a time with the help of the village chief who overseas his village community members. A child or any other family members can represent each family if mom or dad isn’t there. Mostly, the chief will announce weeks before our arrival so they’ll be present but sometimes they just can’t be there due to rice farming obligations. On this humanitarian relief effort it was a little different. Village families have been scattered in five different camps and it’s chaos trying to figure the logistics of it all. Our aid on this trip is only the tip of the iceberg and beginning of more relief effort to come for the good people of Attapeu. We did our very best and was still able to hand out donations per villages in the camps we visited. Our last three days we visited a camp and two villages including Hin Lat with the kind help of the Champasak army unit. It took us seven full days to unload all the donations from Jai Lao and our local partners, Panyathip International School and Moo Panh but every obstacles and hardships we faced was worth it simply to see with our own eyes and hear with our own ears the impact our support means to the villagers. After all, Jai Lao truly believes we are the eyes and ears of all those who have trusted us with their hard earned money. Knowing how much our community of good and gracious hearted people believe in and has faith in our work and mission we would never want to break that circle of trust that took us so many years to build up. Together we will rebuild Attapeu, Laos as we continue to build long term trust and understanding between our organization and the Lao communities in Laos and overseas. Immediate relief aid even while search and rescue is going on is very important. While there’s an abundance of donations coming in and being stored at the provincial warehouses and district camps, there are not enough manpower and resources to move these supplies to the five village camps. By helicopter, boat or off road vehicles are the ways to transport donations to other camps. Very few people would actually venture out of the convenience of the provincial warehouse and district base camp to donate supplies to other camps because it is difficult to get to but Jai Lao went as far and off the beaten path as to Hin Lat village where the flood had the most direct impact. Jai Lao knew we faced many challenges and obstacles getting to other camps. We knew we had to still go cause they needed the visits more since they didn’t have a big common cooking and feeding area. At the case camp, medical and food facilities have been set up to tend to the displaced families. The families can come to get their meals three times a day where volunteers work round the clock to prepare food. Jai Lao donated two truck loads of vegetables, meats, ingredients, cooking utensils, etc. to help feed the villagers to two village camps. Jai Lao helped to volunteer with the Thai Rescue Charity Foundation to proper meals which they deliver to other camps that don’t have food access. They prepared and delivered meals twice a day. After they’d drive two hours to deliver the 1,300-2,000 packed boxes of warm food daily. Essentially these camps further out are only getting one meal a day and the rest they eat dried noodles and water. The aftermath is still going to be a lot of work. The villagers need our help more than ever and Jai Lao will continue to provide aid for as long as we are needed. Thank you for taking this compassionate journey with us. Assessing the situation ourselves is the most trust worthy way Jai Lao receives our information about what’s happening to villagers in their villages. Since 2008, we have always made personal visits to every village we help to initially inquire what help is needed. At times, we rely on the social welfare department of the district to give us data on what and where the neediest villages are. Sometimes, Jai Lao gets direct requests from the village chiefs asking if we can go help their communities. This time around was a bit different. Even the Lao PDR didn’t have a solid statistics on the conditions of the villages that the dam flood had caused yet. This video is from our first day in Attapeu. We were driving to the provincial administration office from Pakse to check ourselves in while our 10 wheel truck with supplies was on its way from Vientiane with a team of eight volunteers. We stopped when we saw people on the side of the road and there was massive damage to the mountain side. We learned that their village was one of the villages that was impacted by the flood. While it wasn’t a direct heavy flood like the other six villages they were still flooded for a few days. The didn’t lose their homes and weren’t in camps but still need some support too. 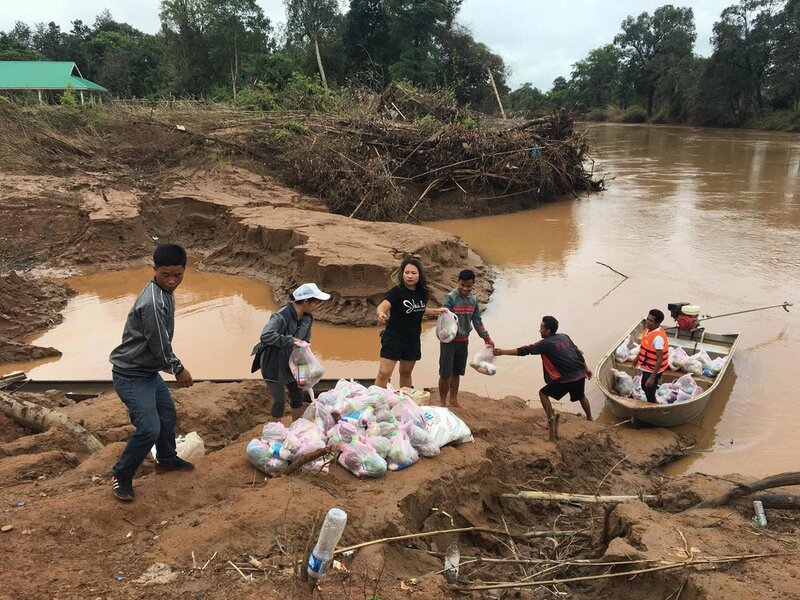 Jai Lao is working with the Ministry of Foreign Affairs and Embassy of Laos, USA to gather as much information as we can about all the villages impacted by the flood. We are also gathering data on our own by talking directly with the village chiefs. From all our sources we will then be able to assess the predicament and know how we will serve and help the villagers on our second phase of relief effort. We will do a three series relief effort. First one we just completed is assessment and initial immediate aid. Then at the end of September we will go back as a team to provide financial relief and will be giving money for all families and the amount will depend on the damage to their homes. Then our third phase, possibly January 2019, will be to physically help rebuild infrastructure of the communities whether it be schools or community centers. As of now the exact details of villages’ needs have not been revealed. There are discussions of moving some of these villages to a different location of higher grounds and also because the villagers don’t want to return to their villages after that kind of loss. As we speak, more permanent camp shelter is being built for the displaced families. The spirit of the Lao people in the midst of tragedy is so amazing! In this video, two adorable ladies talk about the day their village got flooded and how they got themselves out to safety. Thankfully, their village had no lives lost as their village wasn’t one of the four that was heavily and directly impacted by the collapsed dam flood. The resilience and gratitude that these Lao villagers have is so heartwarming and inspiring. They teach us about being simple and happy with what you have not what you don’t have or lost. We learn so much from our conversations with the village community even if it may be brief at times like this one. We had to leave before it got too dark because it was a two hours trip back to our in town where our big truck with more donations was kept. Jai Lao works directly with the Provincial Head of Health and Director of Sanamxay hospital (who both are women #womenempowerment) to assess the medical and health needs of the displaced families throughout other camps in the district. We dropped off a truckload of medications where it is stored in the hospital two days ago. After that, it’s distributed to other camp locations two plus hours away that have set up “makeshift clinics” to treat families in the camp. This is the third medical aid Jai Lao have provided for the Attapeu flood relief effort. The first was donated to the district hospital and the other was given directly to Tamayok village refugee camp. At the time of our medication donation at Tamayok, there wasn’t even any type of clinic set up yet. The camp was still “figuring out” their situation. It’s this camp where Jai Lao would like to focus our relief efforts on as it’s the furthest from the district hospital and camps thus receiving the least amount of aid. Laos struggles with the second-highest rate of malnutrition in East Asia and the Pacific. Nearly every second child under the age of 5 (meaning 50%) is chronically malnourished and a fifth (20 %) of the children living in rural areas are severely stunted. These rates are even higher in remote areas and among some ethnic groups. What we witnessed when we go serve and help children in rural areas are the children who are malnourished. Their light color hair is the first indicator of them being malnourished. Then you notice their height is very stunted where a ten year old child looks as if he’s five years old. But one thing that malnourishment doesn’t affect is the beautiful spirits and smiles of the children. Jai Lao is committed to helping provide nourishment to the children. We are delivering another 2,000 packets of multivitamins to children at all three camps in Attapeu. Your compassionate and generous contributions brings joy to their pure little world. 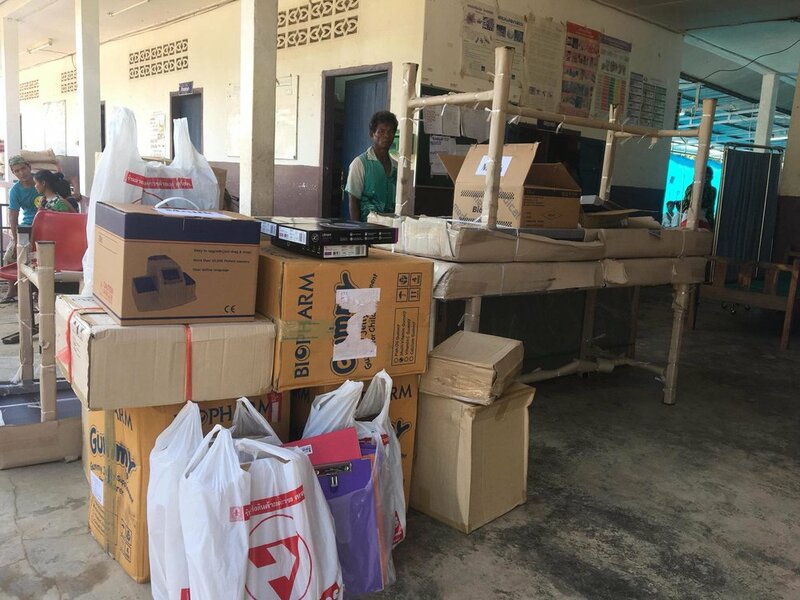 $752 of medications and medical supplies on the way to Tamayok village camp thanks to the aid of the Lao PDR army who’s helping Jai Lao deliver the medicines from their hearts. There are a total of seven camps that families displaced by the flood are staying at and Jai Lao seeks to help them all. Getting to the six other camps (outside of the center district camp and hospital) isn’t an easy feat, especially when it’s monsoon season. Lao, PDR means “Please Don’t Rush” and it’s because the locals have realized there are so many things (like getting flooded again) beyond their control. 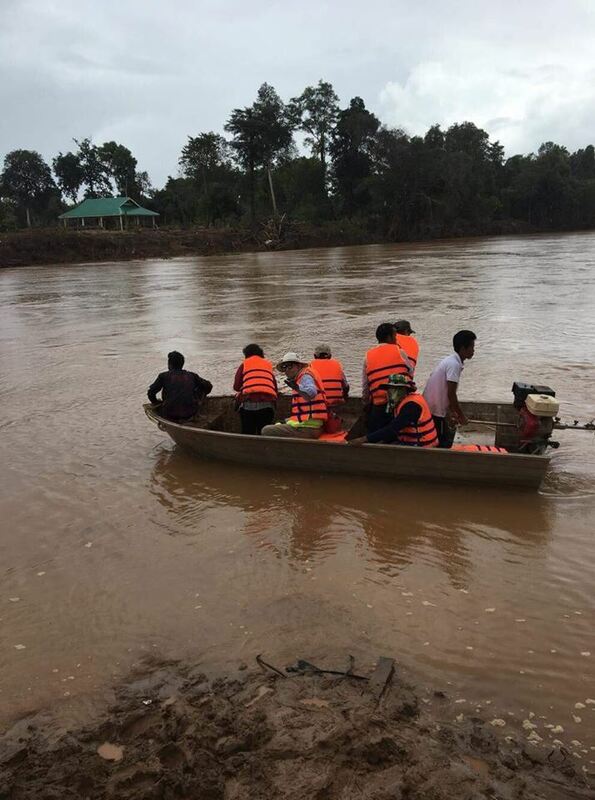 There are ten provinces throughout Laos that are reporting flooding in their villages. Jai Lao was very fortunate to have the aid of the Lao Army to help deliver medications to Tomayod village camp. We delivered much needed medications to this camp last month when the Lao Red Cross hadn’t even set up their clinic. So we are very pleased to fulfill their second medicine wish list as we know the families need it. Jai Lao is so happy to see that the government has provided temporary housing tents for the families since our last visit a month ago. They said they’ve had the tent homes for 21 days now. There are a total of seven camps set up to house the families displaced from their homes due to the collapsed dam. Jai Lao’s mission is to help provide medical and humanitarian aid to all seven village camps. We are very blessed to have Mouky Psa, our dedicated volunteer from Pakse, who’s helping to carry out decisions the Jai Lao Board makes back in the USA. Thank you for those of you who’ve followed our journey and it will be a very long journey before these families will ever return to their normal lives. Together, we will be there to provide relief and help rebuild their homes and village communities in due time. Please meet Xai, Dum and Lair who are children living at Tamayod village camp. We met them while making a second delivery of medications to the Lao Red Cross Clinic that was set up at the camp. The girls are from Hinlat village, the first village to be hit by the major flood from the collapsed dam. Sweet Dum lost both her parents to the flood. Jai Lao will take necessary steps to provide much more help to her and others who have been left orphans from this disaster. We admire the strength and resilience of these beautiful girls deeply. Having lost everything in their lives they still show a strong will to survive and can smile even after a catastrophic event. Xai helps feed her family by catching small fishes from the Xe river by the camp. Dum helps put away the wood that’s been chopped by her grandpa. Under this difficult situation, we often wonder how would we make it through each day? Sanamxay District Hospital is the main hospital where Attapeu flood victims are treated. In addition to the Sanamxay District Hospital, small medical clinics have also been established in various temporary relief camps in the greater Attapeu area. 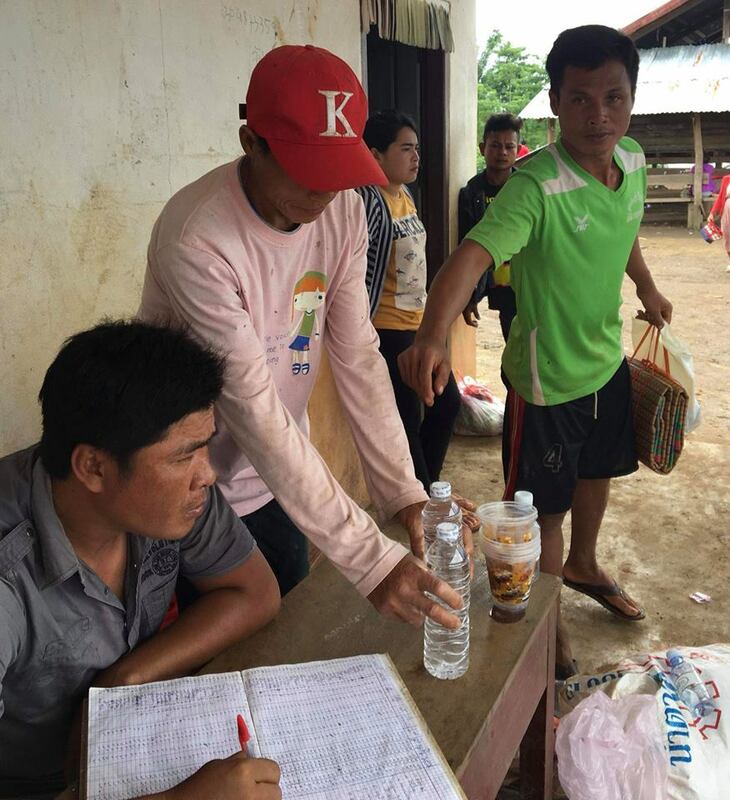 Jai Lao has now provided medication and medical supplies several times since the flood to the Sanamxay District Hospital and to these other small clinics. With large donations, it is Jai Lao’s protocol to also report the donation to the Attapeu Provincial Administration. 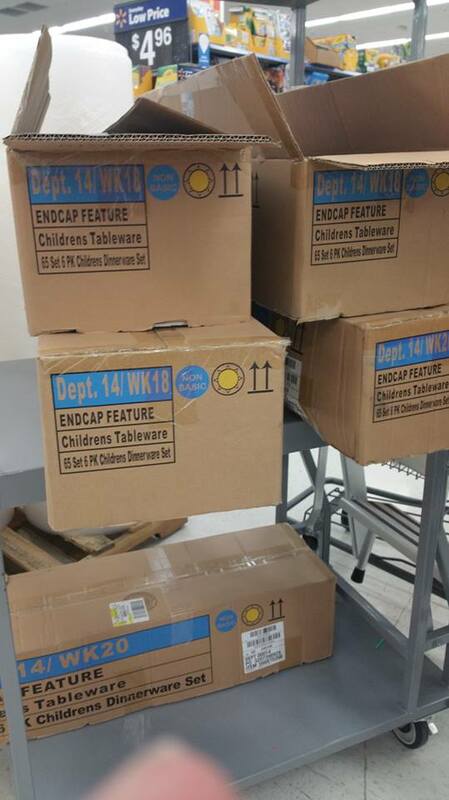 The requested medication and other medical supplies were purchased in Thailand, as Thai suppliers offer higher quality products at more competitive prices. As is typical for Jai Lao donations entering Laos, we have secured a waiver of duty and tariff fees for these donations from the Lao government. Our local Jai Lao volunteer team was led by Mouky, who also welcomed two other volunteers, BeBe and Ricky from the U.S., to help with delivery efforts. 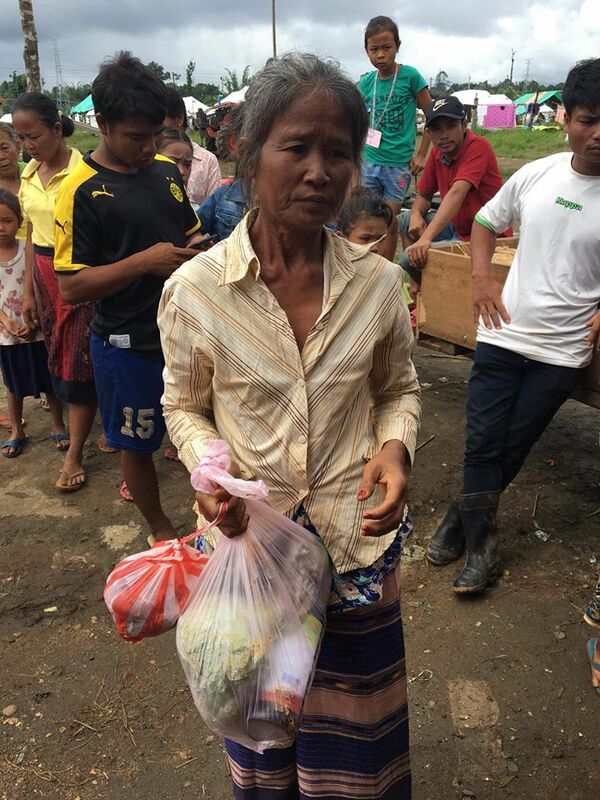 In addition to the requested medication and medical supplies, Jai Lao also purchased fresh meat and vegetables for over 100 families living at the Boak Village Camp (two-hours’ drive from the Sanamxay District Hospital) who continue to live in temporary tent housing until they are able to move into temporary structural housing being built by the SK Group. 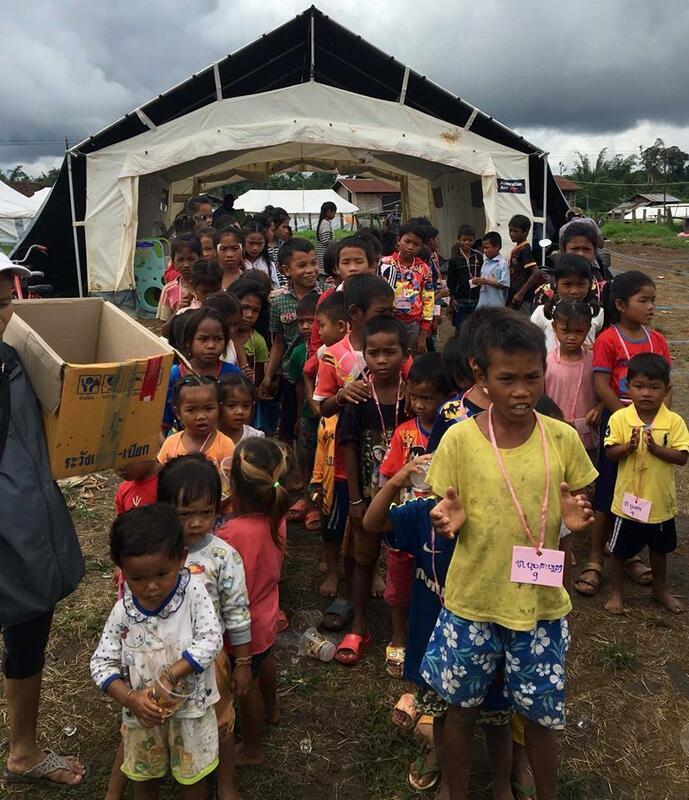 Jai Lao Foundation's amazing volunteers, Mouky Psa and Bebe Souvannavong, visited the first 140 new temporary homes built by SK Group for the Attupue Flood victims. 30 families have already moved into their new space. Our volunteers are assessing the area and needs of these families. Here is a look at their new temporary homes. What does a JLF day look like? Early morning in the United States is late night in Laos. 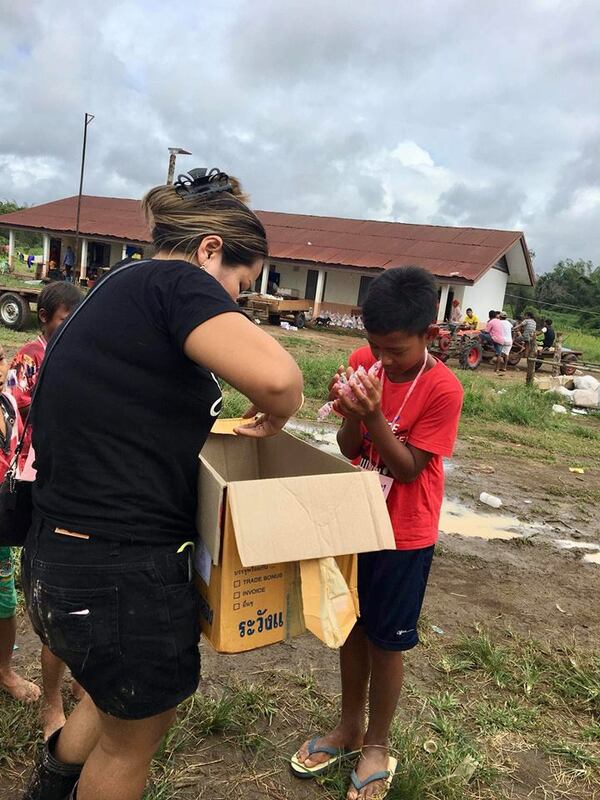 As we in North America fall asleep, the relief effort is continuing in Attapue. JLF's very dedicated volunteer, Mouky has been meeting with each of the 7 temporary camps and the head of their medical clinics. She obtains a list of medical supplies needed and returns later with truck loads of antibiotics, vitamins, IV fluids and even medical equipment. She has been doing an incredible job of coordinating the purchases, transportation and delivery under dire conditions. Transportation has included cars, 4-wheel drive trucks and even military helicopters. When Mouky finally ends her physically and mental taxing day, JLF volunteers in the US and Canada are just starting our day. Between taking care of families and working to pay our bills, we are communicating with supporters and putting every last ounce of energy in to the Attapue Donation Drive. The Donation Drive has been amazing! More details on that to come soon. Volunteers in California have picked up truck loads of clothing from the post office, Fresno, Sacramento, San Jose, Southern California, and beyond. We have shopped thrift stores for winter coats. We have THOUSANDS of hygiene items and rain gear on order and arriving daily. When it is too dark in California to work outside, we turn in for the night and the work load is handed back to Mouky in Laos. While North America sleeps... Jai Lao volunteer, Mouky Psa, is braving out harsh weather conditions to deliver medicine and fresh food to Ban Pindong camp in Attapue. 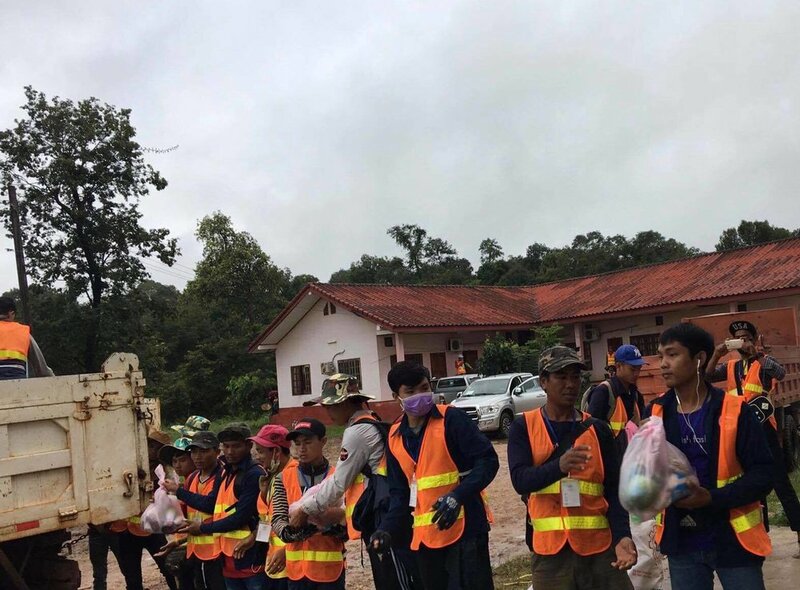 While we were sleeping in the USA.....Fresh food and Medicine delivery to Ban Pindong camp, Attapue, Laos. Pindong Village Camp is a refugee camp to 86 families with a total of 325 people living in temporary tents as homes. Jai Lao volunteer, Mouky, her mom and aunt drove from Pakse to Attapeu and delivered much needed medications and food to Pindong camp yesterday. 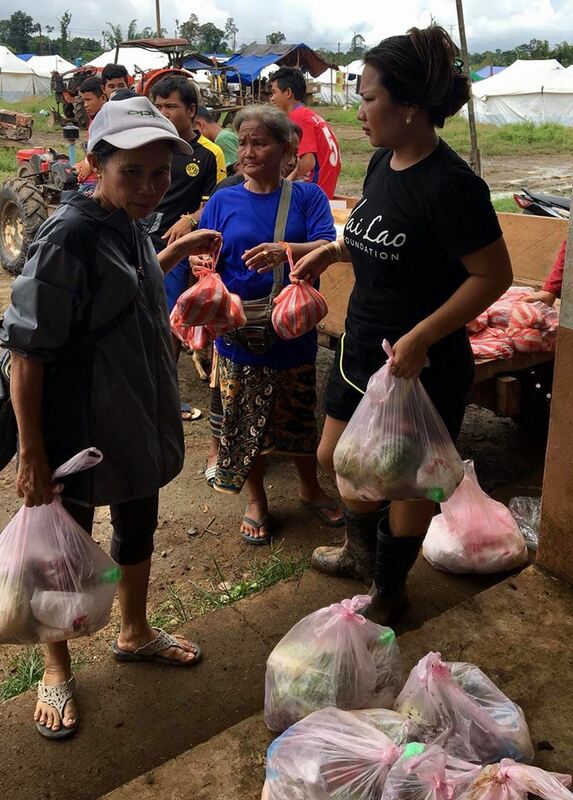 At Sanamxay, she was able to get strong helping hands from volunteer students to organize and load up the food and medications into the first of three types of transportation to get to Pindong camp. Getting to camps outside of the district town limit is very difficult especially as Attapeu continues to get rained and flooded. Due to the heavy rain and flood, she had to spend a night at Sanamxay town before heading out to Pindong with the donations. Rain and flood may slow down our flood relief efforts but it doesn’t stop us from reaching these families to provide for their needs. Transporting donated items to Pindong camp included riding a big truck through the rain and mud and then the villagers came to pick up the goods in several boats. From there more villagers wait to pick up the donations in tok tok tractors. No matter how difficult the journey is getting to the camp, the destination, the families awaiting us with their bright and beautiful smiles makes everything worth it. Knowing that the families will have fresh meat, vegetables, and ingredients to cook good meals warms our hearts. It’s comforting to also know that they will have 30 kinds of medications at the camp clinic to help treat the sick and injured.